No More What’s For Dinner? There’s a period of our family life, let’s say 2000 – 2007 which are known as the Spaghetti years. Within those seven years, at least once or twice a week G and I would get lulled into the ease of not so much “What shall we have for dinner?” but more “What can we have for dinner?” Meaning what do we have in the cupboard and what can we feed little people who range from 6 months to 6 years? The answer was usually pasta. When I returned to work in 2006 I realized I had to get more organized with meals. I couldn’t face one more piece of penne. It had been six years of continuous parenting and within that six years there was a lot of ground beef. Spaghetti bolognese, spaghetti with cheese, meatballs, and lasagna. I was done. And there was only one way to fix the problem. I needed to start meal planning. 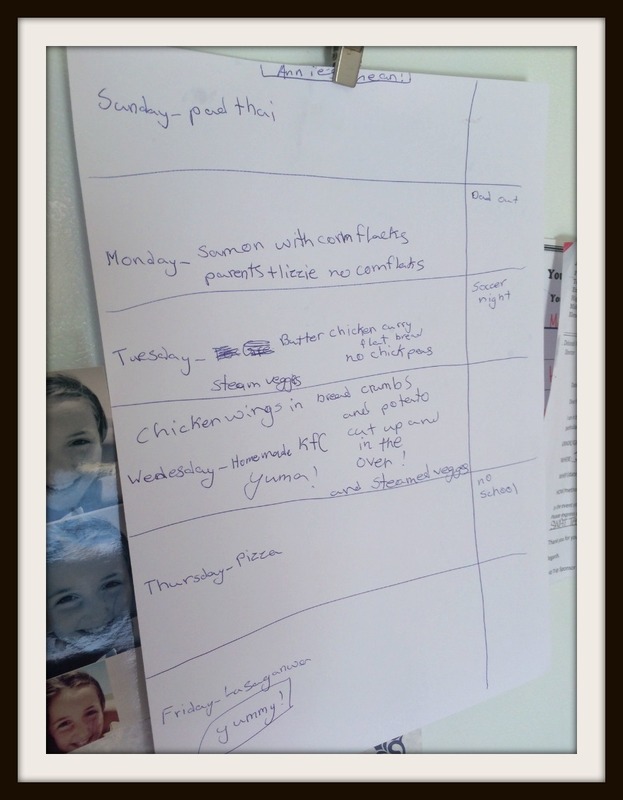 Each Saturday morning I’d throw a piece of paper on the fridge door with the week’s plan, and a trip to the supermarket was made over the weekend to gather supplies. It may sound like an exaggeration to say it was life changing – BUT IT WAS LIFE CHANGING. Not only was it cheaper (I stuck to the list), but the dreaded combination of what am I going to cook for dinner while little mouths called out the dreaded “what’s for dinner” was over. I now can’t live without the meal planner, my days of the aimless shop, or the 5 o’clock panic are over. Up until recently, my menu plan has gone without a hitch. I plan, I write, I decide. It’s been a very one sided affair – and understandably the little travellers have staged a revolt. “Eeeewww, I hate salmon – why do we keep having salmon?” said the screwed up face of Henry Hotdog as he looked at his plate. “Nooooo, chick peas? Why does the chicken curry need chick peas? Chick peas make me barf.” the second little traveller acted out her best mock barf for her audience. “I’m not eating any more Green Chicken Curry. From now on you can just feed me plain white rice – like a prisoner” the third little traveller pouted. “I’ll have yours!” said the first, who eats everything, and lots of it. Her only request so far? No cous cous. It was all starting to do my head in. Trying to remember who wanted what and then listening to the complaints. It was time to introduce a change of plan. Last night was the beginning of the children’s meal planning sessions. Each week a different little traveller gets to choose the menu, the final plan is then run by the family for approval. If you know the second little traveller, you would know that she was drunk with power from the moment the pen made its way into her hand. A list was made, items discussed, debated, people pleaded their case. “Great – so we all have to be vegetarians now?” said the first little traveller, noting the second travellers distaste for red meat. “We’ll turn into chickens by the end of the week” said the third. I giggled and said I’d check him for feathers. The second little traveller compromised, and threw in a token lasagna. As I looked at the list and willed my nose to stop twitching at the spelling mistakes, I wondered about those little tiny people I’d originally planned meals for. I thought about little plastic spoons, first foods, first tastes, first mouthfuls. My decisions, my choices. Did I ever imagine this? A hand written menu plan which included steamed vegetables, thai curries and indian flat bread. It’s done. No more what’s for dinners. What do you do at your house?